Damascus (Arabic: دمشق Dimashq, Syrian Arabic pronunciation: [dɪˈmɪʃeʔ]; Kurdish: Şam or Dimeşq) is the capital and the second largest city of Syria after Aleppo. It is commonly known in Syria as ash-Sham (Arabic: الشام ash-Shām) and nicknamed as the City of Jasmine (Arabic: مدينة الياسمين Madīnat al-Yāsmīn). In addition to being one of the oldest continuously inhabited cities in the world, Damascus is a major cultural and religious center of the Levant. The city has an estimated population of 1,711,000 (2009 est.). Located in southwestern Syria, Damascus is the center of a large metropolitan area of 2.6 million people (2004). Geographically embedded on the eastern foothills of the Anti-Lebanon mountain range 80 kilometres (50 mi) inland from the eastern shore of the Mediterranean on a plateau 680 metres (2,230 ft) above sea-level, Damascus experiences a semi-arid climate due to the rain shadow effect. The Barada River flows through Damascus. First settled in the second millennium BC, it was chosen as the capital of the Umayyad Caliphate from 661 to 750. After the victory of the Abbasid dynasty, the seat of Islamic power was moved to Baghdad. Damascus saw a political decline throughout the Abbasid era, only to regain significant importance in the Ayyubid and Mamluk periods. During Ottoman rule, the city decayed completely while maintaining a certain cultural prestige. Today, it is the seat of the central government and all of the government ministries. The name of Damascus first appeared in the geographical list of Thutmose III as T-m-ś-q in the 15th century BC. The etymology of the ancient name "T-m-ś-q" is uncertain, but it is suspected to be pre-Semitic. It is attested as Dimašqa in Akkadian, T-ms-ḳw in Egyptian, Dammaśq (דמשק) in Old Aramaic and Dammeśeq (דמשק) in Biblical Hebrew. The Akkadian spelling is found in the Amarna letters, from the 14th century BC. Later Aramaic spellings of the name often include an intrusive resh (letter r), perhaps influenced by the root dr, meaning "dwelling". Thus, the Qumranic Darmeśeq (דרמשק), and Darmsûq (ܕܪܡܣܘܩ) in Syriac. The English and Latin name of the city is "Damascus" which was imported from Greek: Δαμασκός, which originated in Aramaic: ‎ דרמשק; "a well-watered place". In Arabic, the city is called Dimashqu sh-Shām (دمشق الشام), although this is often shortened to either Dimashq or ash-Shām by the citizens of Damascus, of Syria and other Arab neighbors and Turkey (as Şam). Ash-Shām is an Arabic term for "Levant" and for "Syria"; the latter, and particularly the historical region of Syria, is called Bilādu sh-Shām (بلاد الشام / "land of the Levant"). Carbon-14 dating at Tell Ramad, on the outskirts of Damascus, suggests that the site may have been occupied since the second half of the seventh millennium BC, possibly around 6300 BC. However, evidence of settlement in the wider Barada basin dating back to 9000 BC exists, although no large-scale settlement was present within Damascus walls until the second millennium BC. Damascus was part of the ancient province of Amurru in the Hyksos Kingdom, from 1720 to 1570 BC. Some of the earliest Egyptian records are from the 1350 BC Amarna letters, when Damascus-(called Dimasqu) was ruled by king Biryawaza. The Damascus region, as well as the rest of Syria, became a battleground circa 1260 BC, between the Hittites from the north and the Egyptians from the south, ending with a signed treaty between Hattusili and Ramesses II where the former handed over control of the Damascus area to Ramesses II in 1259 BC. The arrival of the Sea Peoples, around 1200 BC, marked the end of the Bronze Age in the region and brought about new development of warfare. Damascus was only the peripheral part of this picture which mostly affected the larger population centers of ancient Syria. However, these events had contributed to the development of Damascus as a new influential center that emerged with the transition from the Bronze Age to the Iron Age. Nicolaus of Damascus, in the fourth book of his History, says thus: "Abraham reigned at Damascus, being a foreigner, who came with an army out of the land above Babylon, called the land of the Chaldeans: but, after a long time, he got him up, and removed from that country also, with his people, and went into the land then called the land of Canaan, but now the land of Judea, and this when his posterity were become a multitude; as to which posterity of his, we relate their history in another work. Now the name of Abraham is even still famous in the country of Damascus; and there is shown a village named from him, The Habitation of Abraham. 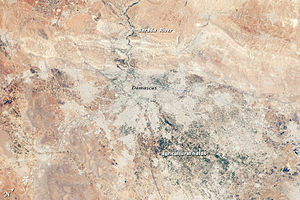 Annotated view of Damascus and surroundings from space. Damascus is not documented as an important city until the arrival of the Aramaeans, Semitic people from Mesopotamia, in the 11th century BC. By the start of the first millennium BC, several Aramaic kingdoms were formed, as Aramaeans abandoned their nomadic lifestyle and formed federated tribal states. One of these kingdoms was Aram-Damascus, centered on its capital Damascus. The Aramaeans who entered the city without battle, adopted the name "Dimashqu" for their new home. Noticing the agricultural potential of the still-undeveloped and sparsely populated area, they established the water distribution system of Damascus by constructing canals and tunnels which maximized the efficiency of the river Barada. The same network was later improved by the Romans and the Umayyads, and still forms the basis of the water system of the old part of the city today. The Aramaeans initially turned Damascus into an outpost of a loose federation of Aramaean tribes, known as Aram-Zobah, based in the Beqaa Valley. The city would gain preeminence in southern Syria when Ezron, the claimant to Aram-Zobah's throne who was denied kingship of the federation, fled Beqaa and captured Damascus by force in 965 BC. Ezron overthrew the city's tribal governor and founded the independent entity of Aram-Damascus. As this new state expanded south, it prevented the Kingdom of Israel from spreading north and the two kingdoms soon clashed as they both sought to dominate trading hegemony in the east. Under Ezron's grandson, Ben-Hadad I (880–841 BC), and his successor Hazael, Damascus annexed Bashan (modern-day Hauran region), and went on the offensive with Israel. This conflict continued until the early 8th century BC when Ben-Hadad II was captured by Israel after unsuccessfully besieging Samaria. As a result, he granted Israel trading rights in Damascus. Another possible reason for the treaty between Aram-Damascus and Israel was the common threat of the Neo-Assyrian Empire which was attempting to expand into the Mediterranean coast. In 853 BC, King Hadadezer of Damascus led a Levantine coalition, that included forces from the northern Aram-Hamath kingdom and troops supplied by King Ahab of Israel, in the Battle of Qarqar against the Neo-Assyrian army. Aram-Damascus came out victorious, temporarily preventing the Assyrians from encroaching into Syria. However, after Hadadzezer was killed by his successor, Hazael, the Levantine alliance collapsed. Aram-Damascus attempted to invade Israel, but was interrupted by the renewed Assyrian invasion. Hazael ordered a retreat to the walled part of Damascus while the Assyrians plundered the remainder of the kingdom. Unable to enter the city, they declared their supremacy in the Hauran and Beqa'a valleys. By the 8th century BC, Damascus was practically engulfed by the Assyrians and entered a dark age. Nonetheless, it remained the economic and cultural center of the Near East as well as the Arameaen resistance. In 727, a revolt took place in the city, but was put down by Assyrian forces. After Assyria went on a wide-scale campaign of quelling revolts throughout Syria, Damascus became totally subjugated by their rule. A positive effect of this was stability for the city and benefits from the spice and incense trade with Arabia. However, Assyrian authority was dwindling by 609–605 BC, and Syria-Palestine was falling into the orbit of Pharaoh Necho II's Egypt. In 572, all of Syria had been conquered by the Neo-Babylonians, but the status of Damascus under Babylon is relatively unknown. The Straight Street of Damascus, the Biblical "Street called Straight"
Damascus was conquered by Alexander the Great. After the death of Alexander in 323 BC, Damascus became the site of a struggle between the Seleucid and Ptolemaic empires. The control of the city passed frequently from one empire to the other. Seleucus I Nicator, one of Alexander's generals, made Antioch the capital of his vast empire, which led to the decline of Damascus' importance compared with new Seleucid cities such as Latakia in the north. Later, Demetrius III Philopator rebuilt the city according to the Greek hippodamian system and renamed it "Demetrias". In 64 BC, the Roman general Pompey annexed the western part of Syria. The Romans occupied Damascus and subsequently incorporated it into the league of ten cities known as the Decapolis because it was considered such an important center of Greco-Roman culture. According to the New Testament, Saint Paul was on the road to Damascus when he received a vision of Jesus. Damascus became a metropolis by the beginning of the 2nd century and in 222 it was upgraded to a colonia by the Emperor Septimius Severus. During the Pax Romana, Damascus and the Roman province of Syria in general began to prosper. Damascus's importance as a caravan city was evident with the trade routes from southern Arabia, Palmyra, Petra, and the silk routes from China all converging on it. The city satisfied the Roman demands for eastern luxuries. Little remains of the architecture of the Romans, but the town planning of the old city did have a lasting effect. The Roman architects brought together the Greek and Aramaean foundations of the city and fused them into a new layout measuring approximately 1,500 by 750 meters (4,900 by 2,460 ft), surrounded by a city wall. The city wall contained seven gates, but only the eastern gate (Bab Sharqi) remains from the Roman period. Roman Damascus lies mostly at depths of up to five meters (16.4 ft) below the modern city. The old borough of Bab Tuma was developed at the end of the Roman/Byzantine era by the local Eastern Orthodox community. According to the Acts of the Apostles, Saint Paul and Saint Thomas both lived in that neighborhood. Roman Catholic historians also consider Bab Tuma to be the birthplace of several Popes such as John V and Gregory III. Muhammad's first interaction with the people of Damascus was when he sent Shiya bin Wahab to Haris bin Ghasanni to the king of Damascus during the Expedition of Zaid ibn Haritha (Hisma) called Harith bin Abi Shamir Al-Ghassani. In the Letter Muhammad stated: "Peace be upon him who follows true guidance. Be informed that my religion shall prevail everywhere. You should accept Islam, and whatever under your command shall remain yours"
After most of the Syrian countryside was conquered by the Rashidun Caliphate during the reign of Caliph Umar, Damascus itself was conquered by the Muslim-Arab general Khalid ibn al-Walid in September–August 635 CE. His army had previously attempted to capture the city in April 634, but without success. With Damascus now in Muslim-Arab hands, the Byzantines, alarmed at the loss of their most prestigious city in the Near East, had decided to wrest back control of it. Under Emperor Heraclius, the Byzantines fielded an army superior to that of the Rashidun in manpower. They advanced into southern Syria during the spring of 636 and consequently Khalid ibn al-Walid's forces withdrew from Damascus to prepare for renewed confrontation. In August, the two powers met along the Yarmouk River where they a fought a major battle which ended in a decisive Muslim victory, solidifying the latter's rule in Syria and Palestine. While the Muslims administered the city, the population of Damascus remained mostly Christian—Eastern Orthodox and Monophysite—with a growing community of Muslims from Mecca, Medina, and the Syrian Desert. The governor assigned to the city which had been chosen as the capital of Islamic Syria was Mu'awiya I. After the death of Caliph Ali in 661, Mu'awiya was chosen as the caliph of the expanding Islamic empire. Because of the vast amounts of assets his clan, the Ummayads, owned in the city and because of its traditional economic and social links with the Hijaz as well as the Christian Arab tribes of the region, Mu'awiya established Damascus as the capital of the entire Caliphate. With the ascension of Caliph Abd al-Malik in 685, an Islamic coinage system was introduced and all of the surplus revenue of the Caliphate's provinces were forwarded to the treasury of Damascus. Arabic was also established as the official language, giving the Muslim minority of the city an advantage over the Aramaic-speaking Christians in administrative affairs. It is critical to note that, at the time Damascus was conquered by the Muslims, the majority of Arabs were either pagans or Christians. Damascus itself was predominantly Aramaic with Arab speaking people. Abd al-Malik's successor, al-Walid initiated construction of the Grand Mosque of Damascus (known as the Umayyad Mosque) in 706. The site originally had been the Christian Cathedral of St. John and the Muslims maintained the building's dedication to John the Baptist. By 715, the mosque was complete. Al-Walid died that same year and he was succeeded at first by Suleiman ibn Abd al-Malik and then by Umar II, who each ruled for brief periods before the reign of Hisham in 724. With these successions, the status of Damascus was gradually weakening as Suleiman had chosen Ramla as his residence and later Hisham chose Resafa. Following the murder of the latter in 743, the Caliphate of the Umayyads—which by then stretched from Spain to India— was crumbling as a result of widespread revolts. During the reign of Marwan II in 744, the capital of the empire was relocated to Harran in the northern Jazira region. On 25 August 750, the Abbasids, having already beaten the Umayyads in the Battle of the Zab in Iraq, conquered Damascus after facing little resistance. With the heralding of the Abbasid Caliphate, Damascus became eclipsed and subordinated by Baghdad, the new Islamic capital. Within the first six months of Abbasid rule, revolts began erupting in the city, albeit too isolated and unfocused to present a viable threat. Nonetheless, the last of the prominent Umayyads were executed, the traditional officials of Damascus ostracized, and army generals from the city were dismissed. Afterward, the Umayyad family cemetery was desecrated and the city walls were torn down, reducing Damascus into a provincial town of little importance. It roughly disappeared from written records for the next century and the only significant improvement of the city was the Abbasid-built treasury dome in the Umayyad Mosque in 789. In 811, distant remnants of the Umayyad dynasty staged a strong uprising in Damascus that was eventually put down. Ahmad ibn Tulun, a dissenting Turkish governor appointed by the Abbasids, conquered Syria, including Damascus, from his overlords in 878-79. In an act of respect for the previous Umayyad rulers, he erected a shrine on the site of Mu'awiya's grave in the city. Tulunid rule of Damascus was brief, lasting only until 906 before being replaced by the Qarmatians who were adherents of Shia Islam. Due to their inability to control the vast amount of land they occupied, the Qarmatians withdrew from Damascus and a new dynasty, the Ikhshidids, took control of the city. They maintained the independence of Damascus from the Arab Hamdanid dynasty of Aleppo and the Baghdad-based Abbasids until 967. A period of instability in the city followed, with a Qarmatian raid in 968, a Byzantine raid in 970, and increasing pressures from the Fatimids in the south and the Hamdanids in the north. The Shia Fatimids gained control in 970, inflaming hostilities between them and the Sunni Arabs of the city who frequently revolted. A Turk, Alptakin drove out the Fatimids five years later, and through diplomacy, prevented the Byzantines from attempting to annex the city. However, by 977, the Fatimids under Caliph al-Aziz, wrested back control of the city and tamed Sunni dissidents. The Arab geographer, al-Muqaddasi, visited Damascus in 985, remarking that the architecture and infrastructure of the city was "magnificent", but living conditions were awful. Under al-Aziz, the city saw a brief period of stability that ended with the reign of al-Hakim (996–1021). In 998, Hundreds of Damascene leaders were rounded up and executed by him for incitement. Three years after al-Hakim's mysterious disappearance, the Arab tribes of southern Syria formed an alliance to stage a massive rebellion against the Fatimids, but they were crushed by the Fatimid Turkish governor of Syria and Palestine, Anushtakin al-Duzbari, in 1029. This victory gave the latter mastery over Syria, displeasing his Fatimid overlords, but gaining the admiration of Damascus' citizens. He was exiled by Fatimid authorities to Aleppo where he died in 1041. From that date to 1063, there are no known records of the city's history. By then, Damascus lacked a city administration, had an enfeebled economy, and a greatly reduced population. With the arrival of the Seljuq Turks in the late 11th century, Damascus again became the capital of independent states. It was ruled by Abu Sa'id Taj ad-Dawla Tutush I starting in 1079 and he was succeeded by his son Abu Nasr Duqaq in 1095. The Seljuqs established a court in Damascus and a systematic reversal of Shia inroads in the city. The city also saw an expansion of religious life through private endowments financing religious institutions (madrasas) and hospitals (maristans). Damascus soon became one of the most important centers of propagating Islamic thought in the Muslim world. After Duqaq's death in 1104, his mentor (atabeg), Toghtekin, took control of Damascus and the Burid line of the Seljuq dynasty. Under Duqaq and Toghtekin, Damascus experienced stability, elevated status and a revived role in commerce. In addition, the city's Sunni majority enjoyed being a part of the larger Sunni framework effectively governed by various Turkic dynasties who in turn were under the moral authority of the Baghdad-based Abbasids. While the rulers of Damascus were preoccupied in conflict with their fellow Seljuqs in Aleppo and Diyarbakir, the Crusaders, who arrived in the Levant in 1097, conquered Jerusalem, Mount Lebanon and Palestine. Duqaq seemed to have been content with Crusader rule as a buffer between his dominion and the Fatimid Caliphate of Egypt. Toghtekin, however, saw the Western invaders as a viable threat to Damascus which, at the time, nominally included Homs, the Beqaa Valley, Hauran, and the Golan Heights a part of its territories. With military support from Sharaf al-Din Mawdud of Mosul, Toghtekin managed to halt Crusader raids in the Golan and Hauran. Mawdud was assassinated in the Umayyad Mosque in 1109, depriving Damascus of northern Muslim backing and forcing Toghtekin to agree to a truce with the Crusaders in 1110. Following Tughtakin's death in 1128, his son, Taj al-Din Buri, became the nominal ruler of Damascus. Coincidentally, the Seljuq prince of Mosul, Imad al-Din Zengi, took power in Aleppo and gained a mandate from the Abbasids to extend his authority to Damascus. In 1129, around 6,000 Isma'ili Muslims were killed in the city along with their leaders. The Sunnis were provoked by rumors alleging there was a plot by the Isma'ilis, who controlled the strategic fort at Banias, to aid the Crusaders in capturing Damascus in return for control of Tyre. Soon after the massacre, the Crusaders aimed to take advantage of the unstable situation and launch an assault against Damascus with nearly 60,000 troops. However, Buri allied with Zengi and managed to prevent their army from reaching the city. Buri was assassinated by Isma'ili agents in 1132; he was succeeded by his son, Shams al-Mulk Isma'il who ruled tyrannically until he himself was murdered in 1135 on secret orders from his mother, Safwat al-Mulk Zumurrud; Isma'il's brother, Shihab al-Din Mahmud, replaced him. Meanwhile, Zengi, intent on putting Damascus under his control, married Safwat al-Mulk in 1138. Mahmud's reign then ended in 1139 after he was killed for relatively unknown reasons by members of his family. Mu'in al-Din Unur, his mamluk ("slave soldier") took effective power of the city, prompting Zengi—with Safwat al-Mulk's backing—to lay siege against Damascus the same year. In response, Damascus allied with the Crusader Kingdom of Jerusalem to resist Zengi's forces. Consequently, Zengi withdrew his army and focused on campaigns against northern Syria. In 1144 Zengi conquered Edessa, a crusader stronghold, which led to a new crusade from Europe in 1148. In the meantime Zengi was assassinated and his territory was divided among his sons, one of whom, Nur ad-Din, emir of Aleppo, made an alliance with Damascus. When the European crusaders arrived, they and the nobles of Jerusalem agreed to attack Damascus. Their siege, however, was a complete failure. When the city seemed to be on the verge of collapse, the crusader army suddenly moved against another section of the walls, and were driven back. By 1154, Damascus was firmly under Nur ad-Din's control. In 1164, King Amalric of Jerusalem invaded Fatimid Egypt, which requested help from Nur ad-Din. The Nur ad-Din sent his general Shirkuh, and in 1166 Amalric was defeated at the Battle of al-Babein. When Shirkuh died in 1169, he was succeeded by his nephew Yusuf, better known as Saladin, who defeated a joint crusader-Byzantine siege of Damietta. Saladin eventually overthrew the Fatimid caliphs and established himself as Sultan of Egypt. He also began to assert his independence from Nur ad-Din, and with the death of both Amalric and Nur ad-Din in 1174, he was well-placed to begin exerting control over Damascus and Nur ad-Din's other Syrian possessions. In 1177 Saladin was defeated by the crusaders at the Battle of Montgisard, despite his numerical superiority. Saladin also besieged Kerak in 1183, but was forced to withdraw. He finally launched a full invasion of Jerusalem in 1187, and annihilated the crusader army at the Battle of Hattin in July. Acre fell to Saladin soon after, and Jerusalem itself was captured in October. These events shocked Europe, resulting in the Third Crusade in 1189, led by Richard I of England, Philip II of France and Frederick I, Holy Roman Emperor, though the last drowned en route. The surviving crusaders, joined by new arrivals from Europe, put Acre to a lengthy siege which lasted until 1191. After re-capturing Acre, Richard defeated Saladin at the Battle of Arsuf in 1191 and the Battle of Jaffa in 1192, recovering most of the coast for the Christians, but could not recover Jerusalem or any of the inland territory of the kingdom. The crusade came to an end peacefully, with the Treaty of Ramla in 1192. Saladin allowed pilgrimages to be made to Jerusalem, allowing the crusaders to fulfill their vows, after which they all returned home. The native crusader barons set about rebuilding their kingdom from Acre and the other coastal cities. Saladin died in 1193, and there were frequent conflicts between different Ayyubid sultans ruling in Damascus and Cairo. Damascus was the capital of independent Ayyubid rulers between 1193 and 1201, from 1218 to 1238, from 1239 to 1245, and from 1250 to 1260. At other times it was ruled by the Ayyubid rulers of Egypt. The patterned Byzantine and Chinese silks available through Damascus, one of the Western termini of the Silk Road, gave the English language "damask". Ayyubid rule (and independence) came to an end with the Mongol invasion of Syria in 1260, and following the Mongol defeat at Ain Jalut in the same year, Damascus became a provincial capital of the Mamluk Empire, ruled from Egypt, following the Mongol withdrawal. The Black Death of 1348–1349 killed as much as half of the city's population. In 1400 Timur, the Turco-Mongol conqueror, besieged Damascus. The Mamluk sultan dispatched a deputation from Cairo, including Ibn Khaldun, who negotiated with him, but after their withdrawal he put the city to sack. The Umayyad Mosque was burnt and men and women taken into slavery. A huge number of the city's artisans were taken to Timur's capital at Samarkand. These were the luckier citizens: many were slaughtered and their heads piled up in a field outside the north-east corner of the walls, where a city square still bears the name burj al-ru'us, originally "the tower of heads". Rebuilt, Damascus continued to serve as a Mamluk provincial capital until 1516. In early 1516, the Ottoman Turks, wary of the danger of an alliance between the Mamluks and the Persian Safavids, started a campaign of conquest against the Mamluk sultanate. On 21 September, the Mamluk governor of Damascus fled the city, and on 2 October the khutba in the Umayyad mosque was pronounced in the name of Selim I. The day after, the victorious sultan entered the city, staying for three months. On 15 December, he left Damascus by Bab al-Jabiya, intent on the conquest of Egypt. Little appeared to have changed in the city: one army had simply replaced another. However, on his return in October 1517, the sultan ordered the construction of a mosque, tekkiye and mausoleum at the shrine of Shaikh Muhi al-Din ibn Arabi in al-Salihiyah. This was to be the first of Damascus' great Ottoman monuments. The Ottomans remained for the next 400 years, except for a brief occupation by Ibrahim Pasha of Egypt from 1832 to 1840. Because of its importance as the point of departure for one of the two great Hajj caravans to Mecca, Damascus was treated with more attention by the Porte than its size might have warranted—for most of this period, Aleppo was more populous and commercially more important. In 1560 the Tekkiye al-Sulaimaniyah, a mosque and khan for pilgrims on the road to Mecca, was completed to a design by the famous Ottoman architect Mimar Sinan, and soon afterwards a madrasa was built adjoining it. Under Ottoman rule, Christians and Jews were considered dhimmis and were allowed to practice their religious precepts. The Damascus affair that took place in 1840 was an incident in which the accusation of ritual murder was brought against members of the Jewish community of Damascus. In addition the massacre of Christians in 1860 was also one of the most notorious incidents of these centuries, when fighting between Druze and Maronites in Mount Lebanon spilled over into the city. Several thousand Christians were killed, with many more being saved through the intervention of the Algerian exile Abd al-Qadir and his soldiers (three days after the massacre started), who brought them to safety in Abd al-Qadir's residence and the citadel. The Christian quarter of the old city (mostly inhabited by Catholics), including a number of churches, was burnt down. The Christian inhabitants of the notoriously poor and refractory Midan district outside the walls (mostly Orthodox) were, however, protected by their Muslim neighbours. American Missionary E.C. Miller records that in 1867 the population of the city was 'about' 140,000, of whom 30,000 were Christians, 10,000 Jews and 100,000 'Mohammedans' with fewer than 100 Protestant Christians. In the early years of the 20th century, nationalist sentiment in Damascus, initially cultural in its interest, began to take a political colouring, largely in reaction to the turkicisation programme of the Committee of Union and Progress government established in Istanbul in 1908. The hanging of a number of patriotic intellectuals by Jamal Pasha, governor of Damascus, in Beirut and Damascus in 1915 and 1916 further stoked nationalist feeling, and in 1918, as the forces of the Arab Revolt and the British Imperial forces approached, residents fired on the retreating Turkish troops. On 1 October 1918, T. E. Lawrence entered Damascus, the third arrival of the day, the first being the Australian 3rd Light Horse Brigade, led by Major A.C.N. 'Harry' Olden. Two days later, 3 October 1918, the forces of the Arab revolt led by Prince Faysal also entered Damascus. A military government under Shukri Pasha was named and Faisal ibn Hussein was proclaimed king of Syria. Political tension rose in November 1917, when the new Bolshevik government in Russia revealed the Sykes-Picot Agreement whereby Britain and France had arranged to partition the Arab east between them. A new Franco-British proclamation on 17 November promised the "complete and definitive freeing of the peoples so long oppressed by the Turks." The Syrian National Congress in March adopted a democratic constitution. However, the Versailles Conference had granted France a mandate over Syria, and in 1920 a French army commanded by the General Mariano Goybet crossed the Anti-Lebanon Mountains, defeated a small Syrian defensive expedition at the Battle of Maysalun and entered Damascus. The French made Damascus capital of their League of Nations Mandate for Syria. When in 1925 the Great Syrian Revolt in the Hauran spread to Damascus, the French suppressed with heavy weaponry, bombing and shelling the city on 9 May 1926. As a result the area of the old city between Al-Hamidiyah Souq and Medhat Pasha Souq was burned to the ground, with many deaths, and has since then been known as al-Hariqa ("the fire"). The old city was surrounded with barbed wire to prevent rebels infiltrating from the Ghouta, and a new road was built outside the northern ramparts to facilitate the movement of armored cars. On 21 June 1941, 3 weeks into the Allied Syria-Lebanon campaign, Damascus was captured from the Vichy French forces by a mixed British Indian and Free French force. The French agreed to withdraw in 1946, thus leading to the full independence of Syria. Damascus remained the capital. The uprising started with peaceful protests in the spring of 2011 and had grown to a civil war over the past year. On 6 January 2012, a car bomb exploded in Damascus killing more than 26 people, most of them civilians. State media said it was a suicide attack and blamed terrorists. In January 2012, clashes between the regular army and rebels reached the outskirts of Damascus, reportedly preventing people from leaving or reaching their houses, especially when security operations there intensified from the end of January into February. On 17 March 2012, twin car bombs hit the heart of the city, targeting the Air Force Intelligence Service and the headquarters of the Security Forces killing at least 27 people, most of them civilians. An Islamic Jihadi faction called "Jabhat al-Nusra" claimed responsibility for the bomb attacks. In the early morning of 19 March, firefights and explosions broke out in the West Villas section of the heavily guarded and upscale Mezzeh neighborhood. By June 2012, bullets and shrapnel shells smashed into homes in Damascus overnight as troops battled the Free Syrian Army in the streets. At least three tank shells slammed into residential areas in the central Damascus neighborhood of Qaboun, according to activists. Intense exchanges of assault-rifle fire marked the clash, according to residents and amateur video posted online. Since the Battle of Damascus, the city has witnessed a security crackdown. Checkpoints have sprung up in the city. Traffic jams, like unemployment, became widespread and countryside refugees sleep in city parks. Damascus lies about 80 km (50 mi) inland from the Mediterranean, sheltered by the Anti-Lebanon mountains. It lies on a plateau 680 meters (2,230 ft) above sea-level. The city has an area of 105 km2 (41 sq mi), out of which 77 km2 (30 sq mi) is urban, while Jabal Qasioun occupies the rest. The old city of Damascus, enclosed by the city walls, lies on the south bank of the river Barada which is almost dry (3 cm (1 in) left). To the south-east, north and north-east it is surrounded by suburban areas whose history stretches back to the Middle Ages: Midan in the south-west, Sarouja and Imara in the north and north-west. These neighborhoods originally arose on roads leading out of the city, near the tombs of religious figures. In the 19th century outlying villages developed on the slopes of Jabal Qasioun, overlooking the city, already the site of the al-Salihiyah neighborhood centred on the important shrine of Sheikh Muhi al-Din ibn Arabi. These new neighborhoods were initially settled by Kurdish soldiery and Muslim refugees from the European regions of the Ottoman Empire which had fallen under Christian rule. Thus they were known as al-Akrad (the Kurds) and al-Muhajirin (the migrants). They lay two to three kilometres(1.2–1.9-miles) north of the old city. From the late 19th century on, a modern administrative and commercial centre began to spring up to the west of the old city, around the Barada, centred on the area known as al-Marjeh or the meadow. Al-Marjeh soon became the name of what was initially the central square of modern Damascus, with the city hall on it. The courts of justice, post office and railway station stood on higher ground slightly to the south. A Europeanised residential quarter soon began to be built on the road leading between al-Marjeh and al-Salihiyah. The commercial and administrative centre of the new city gradually shifted northwards slightly towards this area. In the 20th century, newer suburbs developed north of the Barada, and to some extent to the south, invading the Ghouta oasis. From 1955 the new neighborhood of Yarmouk became a second home to thousands of Palestinian refugees. City planners preferred to preserve the Ghouta as far as possible, and in the later 20th century some of the main areas of development were to the north, in the western Mezzeh neighborhood and most recently along the Barada valley in Dummar in the north west and on the slopes of the mountains at Berze in the north-east. Poorer areas, often built without official approval, have mostly developed south of the main city. Damascus used to be surrounded by an oasis, the Ghouta region (الغوطة al-ġūṭä), watered by the Barada river. The Fijeh spring, west along the Barada valley, used to provide the city with drinking water. The Ghouta oasis has been decreasing in size with the rapid expansion of housing and industry in the city and it is almost dry. It has also become polluted due to the city's traffic, industry, and sewage. Its climate is classified as hot desert (BWh) in Köppen-Geiger system, due to the rain shadow effect of the Anti-Lebanon mountains and the prevailing ocean currents. Summers are dry and hot with less humidity. Winters are mild and sometimes have snow. Annual rainfall is around 130 mm (5 in), occurring from October to May. The historical role that Damascus played as an important trade center has changed in recent years due to political development in the region as well as the development of modern trade. Most goods produced in Damascus, as well as in Syria, are distributed to Countries of the Arabian peninsula. Damascus also holds an annual international trade exposition in the fall since 1955. Damascus has the potential for a highly successful tourism industry. The abundance of cultural wealth in Damascus has been modestly employed since the late 1980s with the development of many accommodation and transportation establishments and other related investments. Since the early 2000s, numerous boutique hotels and bustling cafes opened in the old city which attract plenty of European tourists and Damascenes alike. The real-estate sector is booming in Damascus. Real-estate adviser Cushman & Wakefield listed Damascus office space as the eighth most expensive in the world in 2009. The office market in Damascus is rather immature and the demand for premium office space surpasses supply. However, new supply of office space is expected to be delivered in 2009. Damascus is home to a wide range of industrial activity, such as Textile, food processing, cement and various chemical industries. The majority of factories are run by the state, however. Limited privatization in addition to economic activities let by the private sector were permitted starting in the early 2000s with the liberalization of trade that took place. Traditional handcrafts and artisan copper engraving are still produced in the old city. The Damascus stock exchange formally opened for trade in March 2009, and the exchange is the only stock exchange in Syria. It is currently located in the Barzeh district, within Syria's financial markets and securities commission. Its final home is to be the upmarket business district of Yaafur. The estimated population of Damascus in 2011 was 1,711,000. The Kurds are the largest minority group, with a population of approximately 300,000. Damascus is the centre of an over-crowded metropolitan area with an estimated population of 5 million. The metropolitan area of Damascus includes the cities of Douma, Harasta, Darayya, Al-Tall and Jaramana. The majority of the population in Damascus came as a result of rural-urban migration. The majority of the inhabitants of Damascus are Muslims. It is believed that there are more than 2,000 mosques in Damascus, the most well-known being the Umayyad Mosque. Christians represent 10% of the population. There are some Christian districts in the city, such as Bab Tuma, Qassaa and Ghassani, with many churches, most notably the ancient Chapel of Saint Paul. At the suburb Soufanieh a series of apparitions of the Virgin Mary have reportedly been observed between 1982 and 2004. There was a small Jewish community namely in what is called Haret al-Yahud the Jewish quarter. They are the remnants of an ancient and much larger Jewish presence in Syria, dating back at least to Roman times, if not before to the time of King David. Damascus has a wealth of historical sites dating back to many different periods of the city's history. Since the city has been built up with every passing occupation, it has become almost impossible to excavate all the ruins of Damascus that lie up to 8 feet (2.4 m) below the modern level. The Citadel of Damascus is located in the northwest corner of the Old City. The Damascus Straight Street (referred to in the conversion of St. Paul in Acts 9:11), also known as the Via Recta, was the decumanus (East-West main street) of Roman Damascus, and extended for over 1,500 meters (4,900 ft). Today, it consists of the street of Bab Sharqi and the Souk Medhat Pasha, a covered market. The Bab Sharqi street is filled with small shops and leads to the old Christian quarter of Bab Tuma (St. Thomas's Gate). Medhat Pasha Souq is also a main market in Damascus and was named after Midhat Pasha, the Ottoman governor of Syria who renovated the Souk. At the end of the Bab Sharqi street, one reaches the House of Ananias, an underground chapel that was the cellar of Ananias's house. The Umayyad Mosque, also known as the Grand Mosque of Damascus, is one of the largest mosques in the world and also one of the oldest sites of continuous prayer since the rise of Islam. A shrine in the mosque is said to contain the body of St. John the Baptist. The mausoleum where Saladin was buried is located in the gardens just outside the mosque. Sayyidah Ruqayya Mosque, the shrine of the youngest daughter of Husayn ibn Ali, can also be found near the Umayyad Mosque. The ancient district of Amara is also within a walking distance from these sites. Another heavily visited site is Sayyidah Zaynab Mosque, where the tomb of Zaynab bint Ali is located. Shias, Fatemids and Dawoodi Bohras believe that after the battle of Karbala (680 AD), in Iraq, the Ummayad caliph Yezid brought Imam Husain's head to Damascus, where it was first kept in the courtyard of Yezid Mahal, now part of Umayyad Mosque complex. All other remaining members of Imam Husain's family (left alive after Karbala) along with heads of all other companions, who were killed at Karbala, were also brought to Damascus. These members were kept as prisoners on the outskirts of the city (near Bab al-Saghir), where the other heads were kept at the same location, now called "Raous-us-sohda-e-karbala", visited by all Shias. There is a qibla (place of worship) marked at the place, where Imam Ali-Zain-ul-Abedin used to pray while in captivity. Bab al-Jabiya at the entrance to Souk Midhat Pasha, in the south-west. Other areas outside the walled city also bear the name "gate": Bab al-Faraj, Bab Mousalla and Bab Sreija, both to the south-west of the walled city. Due to the rapid decline of the population of Old Damascus (between 1995–2005 more than 20,000 people moved out of the old city for more modern accommodation), a growing number of buildings are being abandoned or are falling into disrepair. In March 2007, the local government announced that it would be demolishing Old City buildings along a 1,400-meter (4,600 ft) stretch of rampart walls as part of a redevelopment scheme. These factors resulted in the Old City being placed by the World Monuments Fund on its 2008 Watch List of the 100 Most Endangered Sites in the world. It is hoped that its inclusion on the list will draw more public awareness to these significant threats to the future of the historic Old City of Damascus. King Faysal Street, a traditional hand-craft region in a protected buffer zone near the walls of Old Damascus between the Citadel and Bab Touma, is threatened by a proposed motorway. In 2007, the Old City of Damascus and notably the district of Bab Tuma have been recognized by The World Monument Fund as one of the most endangered sites in the world. In October 2010, Global Heritage Fund named Damascus one of 12 cultural heritage sites most "on the verge" of irreparable loss and destruction. The main airport is Damascus International Airport, approximately 20 kilometres (12 mi) away from the city, with connections to many Asian, European, African, and recently, South American cities. Streets in Damascus are often narrow, especially in the older parts of the city, and speed bumps are widely used to limit the speed of vehicles. Public transport in Damascus depends extensively on minibuses. There are about one hundred lines that operate inside the city and some of them extend from the city center to nearby suburbs. There is no schedule for the lines, and due to the limited number of official bus stops, buses will usually stop wherever a passenger needs to get on or off. The number of buses serving the same line is relatively high, which minimizes the waiting time. Lines are not numbered, rather they are given captions mostly indicating the two end points and possibly an important station along the line and Taxicab. Served by Chemins de Fer Syriens, the former main railway station of Damascus was al-Hejaz railway station, about 1 km (0.62 mi) west of the old city. The station is now defunct and the tracks have been removed, but there still is a ticket counter and a shuttle to Damacus Kadam station in the south of the city, which now functions as the main railway station. In 2008, the government announced a plan to construct a Damascus Metro with opening time for the green line scheduled for 2015. The green line will be an essential West-East axis for the future public transportation network, serving Moadamiyeh, Sumariyeh, Mezzeh, Damascus University, Hijaz, the Old City, Abbassiyeen and Qaboun Pullman bus station. A four-line metro network is expected be in operation by 2050. Damascus was chosen as the 2008 Arab Capital of Culture. The preparation for the festivity began in February 2007 with the establishing of the Administrative Committee for "Damascus Arab Capital of Culture" by a presidential decree. Popular sports include football, basketball, swimming, tennis, table tennis, equestrian and chess. Damascus is home to many football clubs that participate in the Syrian Premier League including Al-Jaish, Al-Shurta, Al-Wahda and Al-Majd. Many Other sport clubs are located in several districts of the city: Barada SC, Qasioun SC, Nidal SC, Al-Muhafaza, Al-Fayhaa SC, Al-Thawra SC, Dummar SC and Al-Arin SC. The fifth and the seventh Pan Arab Games were held in Damascus in 1976 and 1992 respectively. Damascus has quite busy midnights. Coffeehouses, where —in addition to Arabic coffee and tea— nargileh (water pipes) are served, proliferate Damascus. Card games, tables (backgammon variants), and chess are activities frequented in cafés. Tishreen Park is one of the largest and popular parks in Damascus. It is home to the annual Damascus Flower Show. Other parks include: al-Jahiz, al-Sibbki, al-Tijara, al-Wahda, etc. Damascus' Ghouta (Oasis) is also a popular weekend-destination for recreation. Many recreation centres operate in the city including sport clubs, swimming pools and golf courses. The Syrian Arab Horse Association in Damascus offers a wide range of activities and services for horse breeders and riders. Madaya: a small mountainous town well known holiday resort. Bloudan: a town located 51 km (32 mi) north-west of the Damascus, its moderate temperature and low humidity in summer attracts many visitors from Damascus and throughout Syria, Lebanon and the Persian Gulf. Zabadani: a city in close to the border with Lebanon. Its mild weather along with the scenic views, made the town a popular resort both for tourists and for visitors from other Syrian cities. Maaloula: a town dominated by speakers of Western Neo-Aramaic. Saidnaya: a city located in the mountains, 1,500 metres (4,921 ft) above sea level, it was one of the episcopal cities of the ancient Patriarchate of Antioch. ^ List I, 13 in J. Simons, Handbook for the Study of Egyptian Topographical Lists relating to Western Asia, Leiden 1937. See also Y. AHARONI, The Land of the Bible: A Historical Geography, London 1967, p147, No. 13. ^ "(in Book Reviews) Ancient Damascus: A Historical Study of the Syrian City-State from Earliest Times Until Its Fall to the Assyrians in 732 BC., Wayne T. Pitard. Review author: Paul E. Dion, Bulletin of the American Schools of Oriental Research, No. 270, Ancient Syria. (May, 1988), p. 98". Links.jstor.org. http://links.jstor.org/sici?sici=0003-097X%28198805%290%3A270%3C97%3AADAHSO%3E2.0.CO%3B2-S. Retrieved 20 June 2010. ^ "The Stele Dedicated to Melcarth by Ben-Hadad of Damascus, Frank Moore Cross. Bulletin of the American Schools of Oriental Research, No. 205. (Feb., 1972), p. 40". Links.jstor.org. http://links.jstor.org/sici?sici=0003-097X%28197202%290%3A205%3C36%3ATSDTMB%3E2.0.CO%3B2-9. Retrieved 20 June 2010. ^ "Online Etymology Dictionary". Etymonline.com. http://www.etymonline.com/index.php?term=Damascus. Retrieved 20 June 2010. ^ "Damascus – Wiktionary". En.wiktionary.org. 9 May 2010. http://en.wiktionary.org/wiki/Damascus. Retrieved 20 June 2010. ^ "Genesis 14:15 (New International Version)". Retrieved on 25 November 2009. ^ "The Antiquities of the Jews, by Flavius Josephus, Book 1, Ch. 6, Sect. 4". Project Gutenberg. http://www.gutenberg.org/files/2848/2848-h/2848-h.htm#link2HCH0006. Retrieved 19 September 2014. ^ "The Antiquities of the Jews, by Flavius Josephus, Book 1, Ch. 7, Sect. 2". Project Gutenberg. http://www.gutenberg.org/files/2848/2848-h/2848-h.htm#link2HCH0007. Retrieved 19 September 2014. ^ Phillips, Jonathan (2007). The Second Crusade: Extending the Frontiers of Christendom. Yale University Press. pp. 216–227. ^ Hans E. Mayer, The Crusades (Oxford University Press, 1965, trans. John Gillingham, 1972), pp. 118–120. ^ Tyerman, Christopher (2006). God's War: A New History of the Crusades. Penguin. p. 350. ^ Hamilton, Bernard (2000). The Leper King and his Heirs: Baldwin IV and the Crusader Kingdom of Jerusalem. Cambridge University Press. pp. 132–136. ^ "The Third Crusade: Richard the Lionhearted and Philip Augustus", in A History of the Crusades, vol. II: The Later Crusades, 1189–1311, ed. R. L. Wolff and H. W. Hazard (Madison, Wisconsin: University of Wisconsin Press, 1969), pp. 45–49. ^ Wolff and Hazard, pp. 67–85. ^ Islamic city. Encyclopædia Britannica. ^ Ellen Clare Miller, 'Eastern Sketches – notes of scenery, schools and tent life in Syria and Palestine'. Edinburgh: William Oliphant and Company. 1871. page 90. quoting Eli Jones, a Quaker from New England. ^ "Blasts Hit Damascus as Syria Gears Up Monitors". Google.com. 17 March 2012. http://www.google.com/hostednews/afp/article/ALeqM5iEG9R6OQBjbLdyT1gJ26FQNehEaQ?docId=CNG.06d4b53471276cf7f83c514412f6affc.4f1. Retrieved 1 September 2013. ^ "Public transportation in Damascus is having an uphill go of it"
^ "Flashpoint international: Jabhat al-Nusra Claims Credit for Twin Bombings in Damascus". Flashpoint-intel.com. http://www.flashpoint-intel.com/miscellaneous/1022-jabhat-al-nusra-claims-credit-for-twin-bombings-in-damascus-.html. Retrieved 1 September 2013. ^ Barnard, Anne (19 March 2012). "Clashes Rock Mezze, an Upscale Area of Damascus". New York Times. http://www.nytimes.com/2012/03/20/world/middleeast/heavy-fighting-rocks-damascus-neighborhood.html. ^ "Heavy gunfire in Syria's capital during the weekend". Haaretz. 10 June 2012. http://www.haaretz.com/news/middle-east/heavy-gunfire-in-syria-s-capital-during-the-weekend-1.435372. Retrieved 10 June 2012. ^ a b "World Weather Information Service – Damascus". World Meteorological Organization. http://www.worldweather.org/099/c00213.htm. Retrieved 1 August 2013. ^ M. Kottek (2006). "World Map of the Köppen-Geiger climate classification updated". Meteorol. Z. 15: 259–263. DOI:10.1127/0941-2948/2006/0130. Retrieved on 1 August 2013. ^ Tyson, Patrick J. (2010). "SUNSHINE GUIDE TO THE DAMASCUS AREA, SYRIA". www.climates.com. http://www.climates.com/ASIA/PDF/SYR02ASA.pdf. Retrieved 26 November 2010. ^ "Average Conditions Damascus, Syria". BBC Weather. July 2011. http://www.bbc.co.uk/weather/world/city_guides/results.shtml?tt=TT002850. Retrieved 3 November 2010. ^ "Climatological Information for Damascus, Syria". Hong Kong Observatory. http://www.weather.gov.hk/wxinfo/climat/world/eng/europe/gr_tu/damascus_e.htm. ^ a b c d e f "Damascus". Encyclopædia Britannica. http://www.britannica.com/EBchecked/topic/150420/Damascus. Retrieved 28 November 2009. ^ "Damascus International Fair". http://www.peife.gov.sy. Retrieved 28 November 2009. ^ a b Cummins, Chip. "Damascus Revels in Its New Allure to Investors". The Wall Street Journal. http://online.wsj.com/article/SB125841487085151317.html. Retrieved 28 November 2009. ^ "Report: Office Space Across the World 2009". Cushman & Wakefield. http://www.cushwake.com/cwglobal/jsp/kcReportDetail.jsp?Country=GLOBAL&Language=EN&catId=100003&pId=c21200007p. Retrieved 28 November 2009. ^ "Inauguration of Damascus Stock Exchange". Syrian Enterprise and Business Center. http://www.sebcsyria.com/web2008/art.php?art_id=1619. Retrieved 28 November 2009. ^ "AFP: Syria launches first stock exchange". Google.com. 10 March 2009. http://www.google.com/hostednews/afp/article/ALeqM5gPsB6CSsyXUgWdxEsC0B_O-jqV-w. Retrieved 20 June 2010. ^ Chatty, Dawn (2010). Displacement and Dispossession in the Modern Middle East. Cambridge University Press. pp. 267. ISBN 978-0521521048. http://books.google.de/books?id=8OsgAwAAQBAJ&pg=PA267&lpg=PA267&dq=Ain+al-Arab+population&source=bl&ots=7tWSLU7k1S&sig=rFdw_k_dAb1J1e8QDQqUrhYHv9c&hl=de&sa=X&ei=7a55VIbPM8HpaOX8gqgM&ved=0CFAQ6AEwBjgK#v=onepage&q=Ain%20al-Arab%20population&f=false. ^ Flood, Finbarr Barry (2001). The Great Mosque of Damascus: studies on the makings of an Umayyad visual culture. 33. BRILL. p. 12. ISBN 978-90-04-11638-2. http://books.google.com/?id=r5f8kxIyykQC&printsec=frontcover&q=. Retrieved 26 November 2009. ^ Sbalchiero in: Laurentin/ Sbalchiero (2007), p. 1093-1097. ^ InterNoetics. "Old Damascus". Damascus.org.sy. http://www.damascus.org.sy/?d=259&id=555. Retrieved 1 September 2013. ^ "The British Syrian Society". Retrieved on 29 May 2009. ^ "Worldmonuments.org". Worldmonuments.org. http://www.worldmonuments.org/. Retrieved 6 November 2011. ^ "GHF". Global Heritage Fund. http://globalheritagefund.org/vanishing. Retrieved 1 June 2011. ^ "الخط الأخضر " أهلاً بكم في موقع الخط الأخضر". Damascus-metro.com. http://www.damascus-metro.com. Retrieved 29 May 2009. ^ "دمشق عاصمة الثقافة العربية 2008". Damascus.org.sy. http://damascus.org.sy/. Retrieved 27 December 2012. ^ "مجلس الإدارة و المجلس الاستشاري". Damascus.org.sy. 22 October 2007. http://damascus.org.sy/?d=298. Retrieved 20 June 2010. ^ Beatties and Pepper, 2001, p. 102. ^ "Syrian Arab Horse Association". Saha-sy.org. http://www.saha-sy.org/. Retrieved 20 June 2010. Burns, Ross (2005). Damascus: A History. Routledge. ISBN 978-0-415-27105-9. http://books.google.com/?id=1_bQTrpf62cC&dq=damascus. .
Jill, Duchess of Hamilton (2002). First to Damascus: The story of the Australian Light Horse and Lawrence of Arabia. ISBN 0-7318-1071-6. .
Aharoni, Yohanan; Avi-Yonah, Michael (1977). The MacMillan Bible Atlas. Carta Ltd.. ISBN 0-7318-1071-6. .
(2006) "Il Minareto di Gesù". .
Wikivoyage has a travel guide for Damascus. This page uses content from the English language Wikipedia. The original content was at Damascus. The list of authors can be seen in the page history. As with this Familypedia wiki, the content of Wikipedia is available under the Creative Commons License.